Throughout the world, fans assemble at conventions and gatherings adorned in intricate costumes, gravity-defying hairstyles, and elaborate make-up modeled after their favorite characters from popular culture. The trend is called “cosplaying” and those who engage in it are called “cosplayers.” As anyone who has attended or seen pictures from a recent convention knows, cosplaying in recent years has gone far beyond a lone Trekkie wearing a Federation redshirt. Cosplayers have recreated entire casts of characters, including the most obscure. Indeed, an emerging trend in cosplay has been to seek novelty, as a cosplayer wants to strike out into new territory rather than being the 10,000th person to don a Darth Vader costume. Many serious cosplayers have ramped up their skills at finding unique and complex subjects to show off their art. Thus Volpin Props, renowned and superbly talented designer of videogame, fantasy, and real-world prop replicas, recreated the design of the carpet at the Marriott Marquis Atlanta hotel. Yes, a hotel carpet. This particular Marriott is a host hotel for Dragon*Con, one of America’s largest conventions, and would be a familiar sight to Dragon*Con attendees. 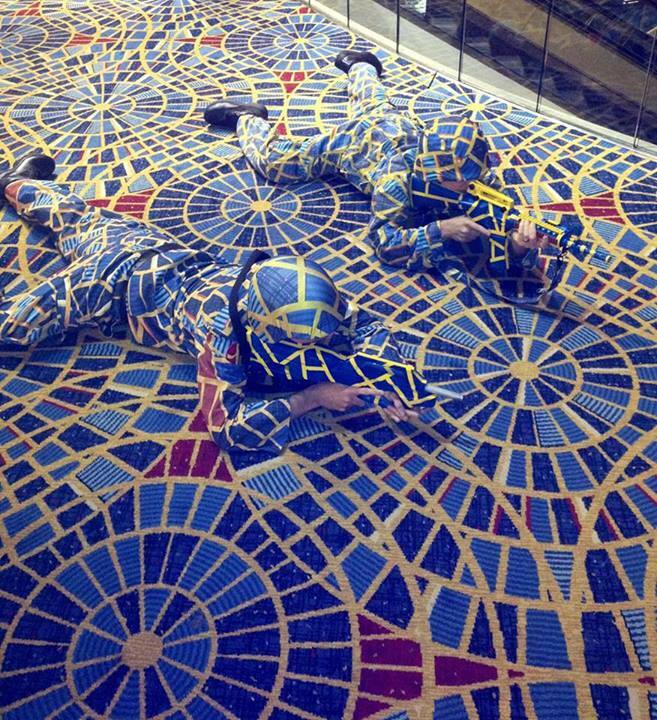 Volpin not only recreated the design of the carpet, but also created costumes to be worn at Dragon*Con which incorporated the design of the carpet. In a virtuosic display of optical illusion and creativity, the costumes were designed so that those wearing the costumes would blend into the carpet if they laid themselves down in the proper position. The result was the stunning photo above. Of all the things to get a Cease and Desist over, of ALL the replicas I’ve made over the years, I’ve received one from Courtisan Inc, designers if (sic) the Marriott Marquis Atlanta hotel carpet. Spoonflower has pulled the design, as is their right, so sorry everyone who wanted some fabric of their own! Fabric designs enjoy more protection under copyright law than costumes themselves. Some costumes are not even copyrightable at all. Garments are generally considered “useful articles” which are incapable of copyright protection, unless the garment “incorporates pictorial, graphic, or sculptural features that can be identified separately from, and are capable of existing independently of, the utilitarian aspects of the article.” 17 U.S.C. § 101. This separability must at least be physical or conceptual in nature to be entitled to protection under copyright law. United States Copyright Office Policy Decision: Registrability of Costume Designs, 56 Fed. Reg. 56,530, 56,532 (1991). For example, fanciful renditions of a “Tigress” and “Magic Dragon” costume with unique color combinations, arbitrary placement of physical features, and sculptured headpieces were held to be copyrightable because the artistic components were conceptually separable. National Theme Productions, Inc. v. Beck, 696 F. Supp. 1348 (S.D. Cal. 1988). Fabric designs, in contrast to costumes, are easier to copyright. In L.A. Printex Industries, Inc., v. Aeropostale, Inc., the court held that while the mere idea of a particular floral configuration was not protected under copyright law, the original selection, coordination, and arrangement of the bouquets and branches in the fabric was protectable. 676 F.3d 841, 849 (9th Cir. Cal. 2012). Though the artistic merit of the bizarre carpet itself has been questioned, the gold, blue, and red segmented circles are arranged and coordinated into an original configuration, and the 2nd Circuit would consider the design a “writing.” The carpet design would likely be afforded copyright protection based upon Courtisan Inc.’s unique pattern. Unfortunately that means that creating and selling a replication of this carpet through an online fabric store is probably copyright infringement. Interestingly, the cosplay of the carpet itself—as distinguished from the sale of the fabric itself–would most likely satisfy fair use requirements and be classified as a parody. The cosplayers are clearly imitating the carpet for comic effect. For legal purposes, a “parody” is “a literary or artistic work that imitates the characteristic style of an author or a work for comic effect or ridicule.” Campbell v. Acuff Rose Music, Inc., 10 U.S. 569, 578 (1994). Fair use is one of copyright law’s “built-in First Amendment accommodations” allowing the public to, “use not only facts and ideas contained in a copyrighted work, but also expression itself for limited purposes.” Eldred v. Ashcroft, 537 U.S. 186, 190 (2003). This “First Amendment accommodation” provides the public “considerable latitude” for commentary and parodies. Id. In this case, the cosplayers themselves, camouflaged against the carpet, bring a comic element that would be absent in the fabric by itself. As such, if the cosplayers were sent a cease and desist notice merely for posting pictures of themselves in the carpet costumes on their social media accounts, they would have a strong defense. This, however, is not what happened in this case. If this area of law seems tricky and involved that is because it is. Assuming that a particular costume design has artistic elements capable of being protected, a cosplay which does not critique or comment on a copyrighted work for comic purposes would have to satisfy the traditional fair use requirements. Readers curious about whether a particular cosplayer who dresses as a character other than for “comic effect or ridicule” are encouraged to read Nerds in Court co-founder Christina Evola’s ASCAP award winning article “The Next Generation of Costumes and Conventions: Is Cosplay Copyright Infringement? (click here to download for free). There, after discussing the historical background of cosplay, she illustrates the likelihood of whether a fictional Princess Leia cosplayer would be held liable for copyright infringement. She first provides a copyright infringement analysis, followed by a fair use assessment.